On Friday and Saturday, Feb. 1-2, 2019, VEX Robotics, along with St. Cloud Technical & Community College, hosted the 2019 State Championship at the River’s Edge Convention Center in St. Cloud, MN. 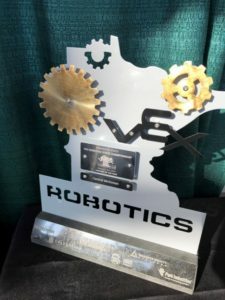 More than 350 VEX Robotics teams in Minnesota compete in 36 events throughout the state to earn an invite to the State Championship. Participants range in age from from second to twelfth grade. Teams who compete at the State level may possibly be invited to participate in the VEX Robotics World Championship, which will be held in Louisville, KY, in April. Central McGowan is proud to have been named MN VEX Partner of the Year and to be an ongoing sponsor of this event. It gives students hands-on STEM (Science, Technology, Engineering, Mathematics) learning and exposure, which may lead them to pursue STEM-based careers. STEM workers are vital to the sustained growth and stability of the U.S. economy. Furthermore, STEM education helps develop critical thinking skills and our next generation of innovation leaders. The study of robotics touches all elements of STEM, and VEX encourages both collaborative and explorative learning. Learn more on the Minnesota VEX Facebook page.